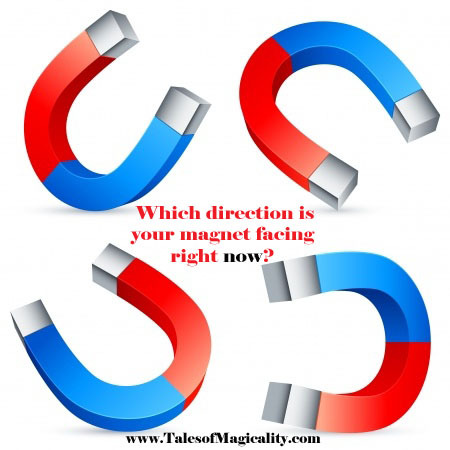 Magicality Moment #2: Which direction is your magnet facing right now? Take a moment right now to determine which direction your magnet is facing right now. Is it UP and Smiling indicating you are in a good positive mood sending out good positive vibes to the universe? Is it DOWN and Frowning, indicating you are in a bad negative mood conversely sending out bad and negative vibes to the universe? If it is Up you are on the right track to attracting miracles into your life. If is is down, take a moment to think of ALL of the things you are grateful for in your life. Feel the gratitude through your body and then begin to feel the shift of your magnet from Down to UP. Keep repeating this until your magnet is UP.